We all appreciate how greasy and messy the tiles around our kitchen work surfaces can become. This has led to the formulation of a good number of products specifically designed to lift off the gunge which can so easily accumulate there. But whereas such mess can usually be easily spotted on the tiles in our kitchens, in our bathrooms we have the difficulty that the cause of the problem doesn’t make itself obvious until it has accumulated to a degree which becomes difficult to shift. Many of the substances which cause marking or staining on our bathroom tiles leave behind a residue whose colour matches the tiles and the grout themselves, that is, white. It only becomes apparent some time later, when the gunk has had a chance to work its way deep into the tiles, or more especially, the grout which fixes them together and to the wall, that its ugly work really becomes apparent. So many online forums have discussed how to deal with the problem of stained tiles, and have put forward a range of solutions to the problem. – One of the most recommended suggestions is to use a car wax on the tiles. Just like the surface of a car’s bodywork, this will leave it gleaming, and will also repel much of the dirt which causes the marks in the first place. This is because they result from either the components of the water itself, for example, the salts which are used to soften it, or from the cleaning agents which are used to produce good results on a variety of surfaces, not least the human skin. – A solution relied upon by many professional cleaning workers is a product called Stardrops. You don’t need to look far online to find loads of recommendations for this product, and not just for cleaning tiles. But this is a concentrated cleaning product, so no matter what you’re using it on, it is best diluted in a solution of water at a ratio or about 15:1. – Wall tiles can be cleared of light staining by using just a mild detergent and warm water, although users of such products say that it’s important to rinse them thoroughly after applying the solution. – One of the most vital ‘don’ts’ for cleaning tiles is do not use any product which contains abrasives. While not all tiles are super-glossy in appearance, even those which have a duller finish can be badly affected by the abrasives contained in many cream and powder cleaners. – Once one of these substances has been put to work, the tiles can be cleaned either by vigorous rubbing with a dry, lint-free cloth, or by using a proprietary tile finishing product. Which one you opt for is likely to be determined by how much time you have to devote to the job! 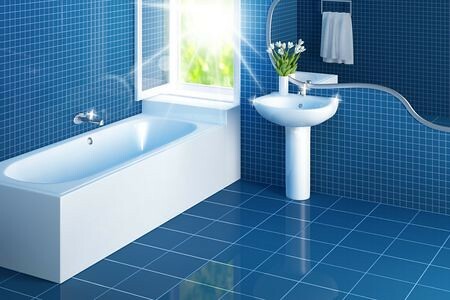 For ongoing maintenance, a product designed specifically for tile cleaning is best used, and should be applied as soon after the tiles have been marked as possible, for example, every time after someone has used the shower. This way, any in-depth cleaning of the tiles and grout, carried out perhaps every six months, will be made much easier. Johan Kemp is an interior design blogger currently writing in conjunction The Tiles Outlet who provide the highest quality tiles for your home.